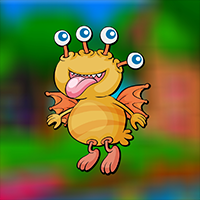 AVM Monster Bee Escape is another point & click escape game developed by AVMGames. Not all monsters are bad. You proved that when you became close to the monster under your bed. He invites you every day to his world and it is so much fun in there. In there, you met so many friendly monsters and most of them are fluffy. You love to hug those cute monsters especially the one under your bed. In fact, this monster tells you bed time stories every night. However, he didn't show up tonight and that is quite unusual. You are afraid that something bad might happen to him so you went out to find him. After few minutes of looking, you finally saw him but he is not in a good position. He is in a cage and people did this to him. They don't know that this monster is friendly. You have to find a way to rescue the monster. Good Luck and have fun!